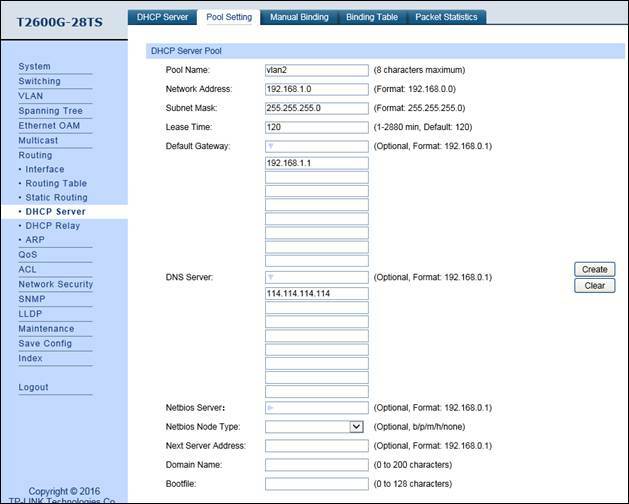 How to manage EAPs in different subnets using EAP/Omada Controller (via DHCP option 138)? 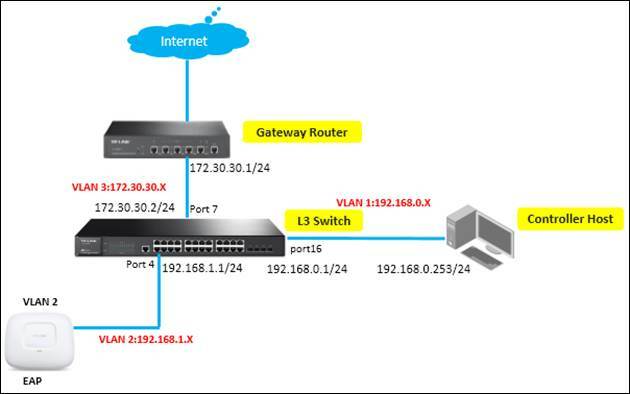 In the network topology below, there are three VLANs (three subnets), which are VLAN1 (192.168.0.0/24), VLAN2 (192.168.1.0/24) and VLAN3 (172.30.30.0/24). These three VLANs (three subnets) are divided by TP-Link L3 Switch (T2600G-28TS). 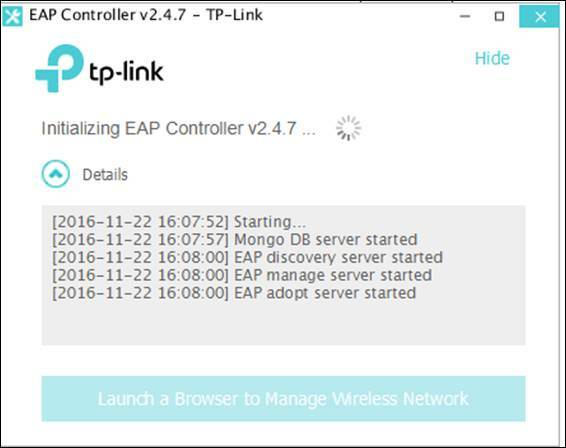 Now we want TP-Link EAP Controller in VLAN1 (192.168.0.0/24) to manage EAP in VLAN2 (192.168.1.0/24). The gateway Router is TP-Link SMB router TL-ER6120. How to build up a multi-nets network using the Multi-nets NAT feature on TP-Link router with a L3 switch? 1. Create VLAN2 & VLAN3. VLAN2 includes port 4, and VLAN3 includes port7. 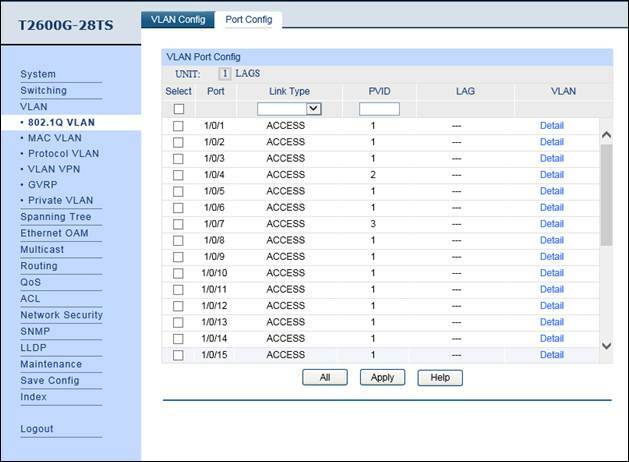 The detailed VLAN settings are shown as below. Note: port4/7/16 should be configured as “Access” type. 2. Enable IP interface for VLAN1 & VLAN2 & VLAN3, and configure relevant IP addresses for these three interfaces shown as below. 3. Configure the static default routing entry which leads to the gateway router. 4. 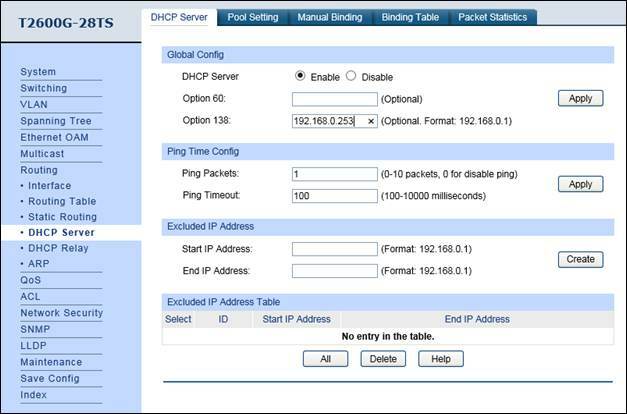 Enable DHCP Server function, and configure 192.168.1.0/24 IP address pool for EAPs. For Option138, you should fill in the IP address of EAP/Omada Controller Host which is “192.168.0.253”. And then the DHCP Server will tell the EAPs where the EAP/Omada Controller is, so that the EAP/Omada Controller and EAPs can communicate with each other among different subnets. Note: don’t forget to fill in the DNS server address. 1.Configure Static Routing for VLAN1 and VLAN2 subnets. 2. Configure multi-nets NAT for 192.168.0.0/24 and 192.168.1.0/24 subnets. Step3. Run EAP Controller. The EAP will appear in EAP/Omada controller’s “pending” list, which means you can use EAP/Omada controller to adopt and manage this EAP now shown as below.